Although the pre-expansion patch for World of Warcraft technically dropped last month, it wasn’t until this week that the pre-expansion events began. Chaos reigns across Azeroth, and the Illidari rise to meet the challenge. Be warned: There will be spoilers aplenty in this post. My first act was to go out and do the Broken Shore scenario, on both factions. As the first taste of Legion content, it leaves a very, very good first impression. Warcraft’s storytelling has always been hit and miss, but the Broken Shore is definitely a hit. 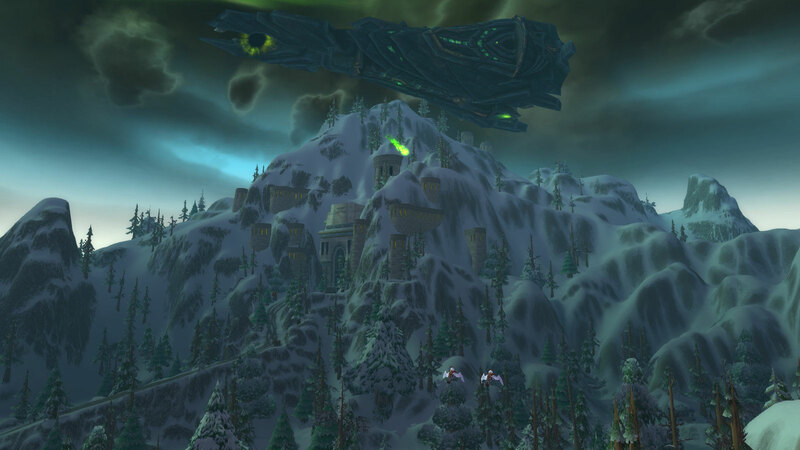 It calls to mind some of WoW’s best story moments to date, like the Wrathgate and Pandaria. It’s very rare for a story to be willing to hand its protagonists a loss, and doubly so for a video game to do so, but that’s exactly what happened at the Broken Shore. We mustered together the mightiest forces on Azeroth — the Horde, the Alliance, and the Argent Crusade — and hurled them against the Burning Legion. And the Legion crushed us, almost effortlessly. Up until now, WoW had defanged the Legion. We ran roughshod over them in Burning Crusade and WoD, and they lost all their intimidation factor as villains. The Legion we met on the Broken Shore is the Legion I remember from Warcraft III: a terrifying, all-consuming wave of destruction. I have for a long time disliked Blizzard’s decision to make demons endlessly reincarnate in the Twisting Nether, but having been confronted with basically every major demon we’ve ever killed since Warcraft III, I’m starting to think maybe there was some method to Blizzard’s madness. That was a pretty horrifying moment. I played through the scenario on the Alliance side first, and I was worried they were turning the Horde into Saturday morning cartoon villains again, but once I played the Horde side, I was glad to discover there is another side to the story. 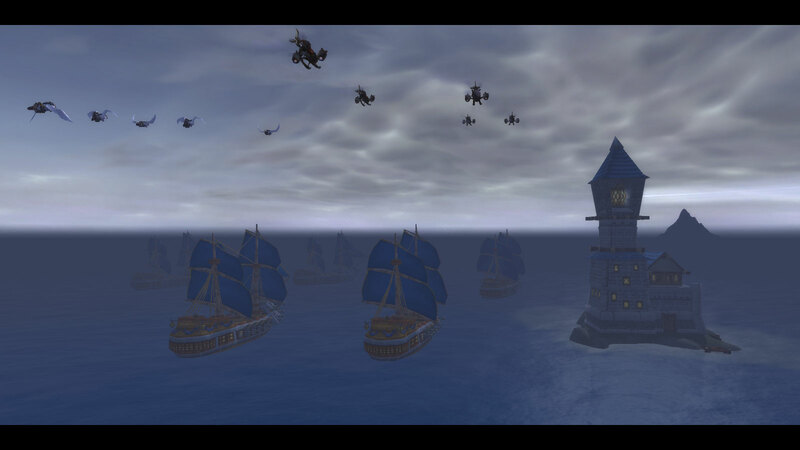 This, again, is emblematic of Warcraft’s story-telling at its best: neither side entirely right or wrong. I’m not thrilled with Blizzard beating the faction conflict drum yet again, but I am glad they at least presented a logical scenario where both sides are justified in their actions from their own perspective. When I first heard the spoilers about Varian dying, I was upset, but the more I think about it, the more I’m okay with it. He’s had a really satisfying arc with strong development, and he died a good, heroic death. His loss further reinforces the Legion’s newly regained fear factor, and this should allow Anduin to step into the spotlight and develop in interesting ways. The one thing I’m not sure about is making Sylvanas warchief. Sylvanas is a great character, and I’ll give Blizzard some props for putting a female character in a position of prominence, but poor Vol’jin was warchief for all of about five minutes, and it doesn’t make a lot of sense. It’s the same situation as when Garrosh was put in charge; there’s a lengthy list of clearly better candidates, including but not limited to basic campfire and a stack of peacebloom. That said, I’m not at all convinced Vol’jin is actually dead. Trolls are notoriously hard to kill, and we didn’t really see his body — just a masked Troll on a funeral pyre. I don’t know why Vol’jin would want to fake his death, but given the lack of hard evidence of his demise and Blizzard’s love of “setbacks,” I can’t escape the feeling this is just another of his long cons. Supposedly future weeks will see new story quests added, leading up to Legion’s launch. I can only hope they’ll be as spectacular as the Broken Shore. By the way, if you’ve done Broken Shore, give Karazhan a visit. You’ll see why. The repeatable content for this event comes in the form of the Legion’s invasions, and while they’re not quite so pitch perfect as the Broken Shore, they’re pretty damn cool. 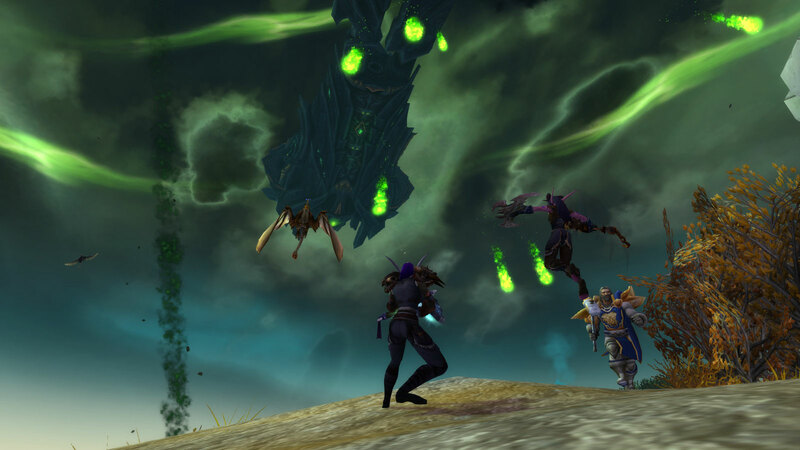 The invasions utilize new technology that allows for dynamic events unlike anything we’ve seen before in WoW. When a zone is targeted by the Legion, the skies become stormy, dimensional ships warp in overhead, and demons and Legion fortifications begin appearing all across the zone. What follows is a zone-wide war with players darting everywhere, fire raining from the skies, and chaos on a grand scale. The invasions, again, restore the intimidation factor the Burning Legion commanded in the old RTS days. They really do feel apocalyptic, and there’s nothing more epic than watching an entire army of players mount a desperate defense of the gates of Orgrimmar as the Legion presses the attack. As a rule I’m the sort of person who plays MMOs despite the social aspects more so than because of them, but there aren’t a lot of single-player games that can offer experiences like this. The cynic in my says that this is the sort of thing Rift and Guild Wars 2 have been doing — and doing better — for years, but it’s still a new experience in WoW, and it sells the story of Legion very well. It feels like nowhere is safe from the Legion, whereas the Iron Horde felt toothless because they never affected anything outside the Blasted Lands. One other thing I like is that the invasions are (nearly) level agnostic. Normally Blizzard only cares about endgame players, but anyone from level ten up can join an invasion and be scaled up to contribute. Rewards will also scale to the character’s level. My one complaint would be that the final boss of each invasion seems to inevitably turn into a complete horror show. Expect high repair costs. Aside from the invasions, the Nathrezim have also begun infiltrating the cities. 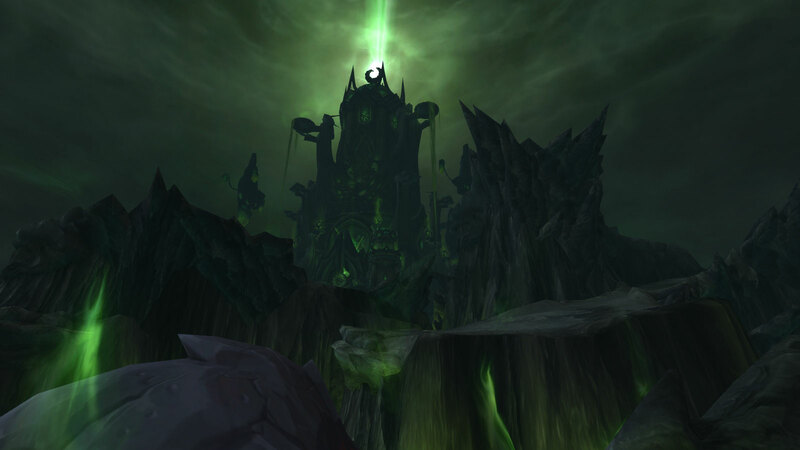 Players can receive the promise of dark power and begin spreading the evil of the Legion. In practical terms this is a mini-game where one must tag other players while evading the wrath of the local NPCs and anyone else who wants to rough you up. If you can survive long enough, you will be briefly transformed into a massive dreadlord raid boss and run amok. I’m not normally the ganking type, but I have to say I could not suppress my evil glee the one time I transformed and managed to slaughter a good chunk of Orgrimmar — players and NPCs alike. The one confusing thing about this is that there are also NPC dreadlord bosses that will occasionally attack cities, and while they appear virtually identical to transformed players, only the NPCs offer rewards when killed. At least I think that’s how it works. Nothing in-game explains any of this, and I’m still not entirely sure I’ve got it figured out. 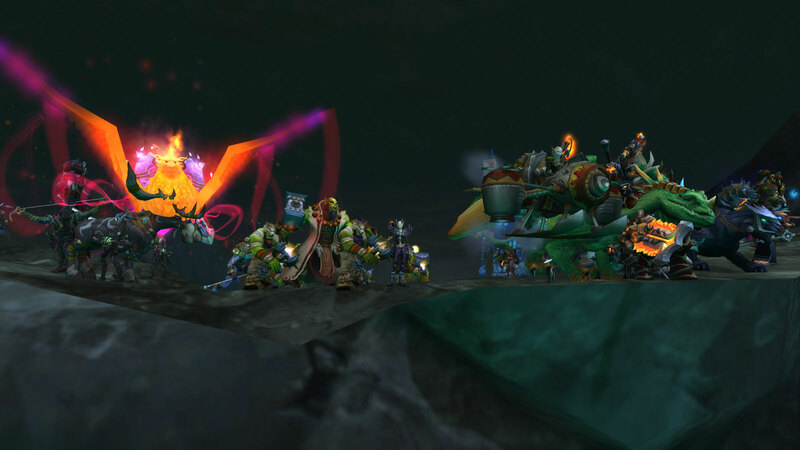 The invasions and the dreadlords combine to create near constant anarchy throughout the game. Right now it really does feel like the world is ending and we’re all doomed. Which would be awful if this were reality, but it’s a video game, so it’s fracking awesome. Finally, I have made my demon hunter. I chose to swallow my bitterness over losing demonology and keep an open mind. 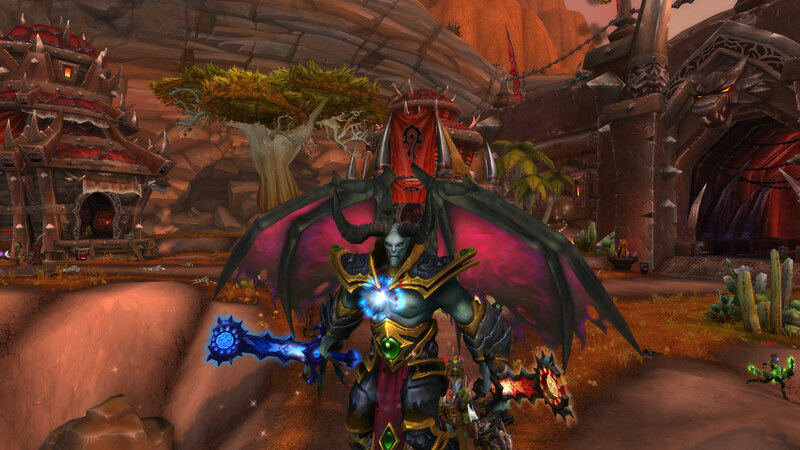 I did, however, model my demon hunter after my warlock as much as possible. Rather than come up with a new character, I’ve decided they’re the same person as far as RP goes. She was already pretty close to a demon hunter anyhow. Of the new additions, I’m honestly least impressed with the demon hunter. After hearing so much hype about how amazing the demon hunter starting experience is, I was a little underwhelmed. It’s decent — my only major complaint is being forced to play havoc spec for most of it — but WoW has better starter experiences. Namely those for Worgen, Pandaren, and death knights. Maybe it’s just my becoming jaded, but I didn’t find myself growing attached to the characters in the demon hunter experience the way I did for the others mentioned. The only one I had much affection for was Kor’vas Bloodthorn, mainly because she was in the Harbingers short (also her little horns are adorable). The one noteworthy thing about it was a point in which the player is given a choice that actually affects the story, and will theoretically continue to have consequences in Legion. That’s not something WoW has ever done before — an intriguing precedent. Similarly, the class is solid, but I can’t entirely escape the feeling I’m just playing an emo monk. Demon hunters have solid mechanics, but there’s nothing particularly unique about how they play. I’m also a bit disappointed how boring metamorphosis is. When I heard the havoc version changed some of your abilities, I got excited, but the meta abilities are almost exactly the same as the basic ones; they just do more damage. Vengeance’s meta at least speeds up your rotation, but that’s not exactly earth-shattering. For such an iconic ability, I was expecting a lot more than a generic “you get bigger numbers for a little bit” cooldown. This isn’t just a downgrade from the demonology meta; it’s a downgrade from the Warcraft III meta. 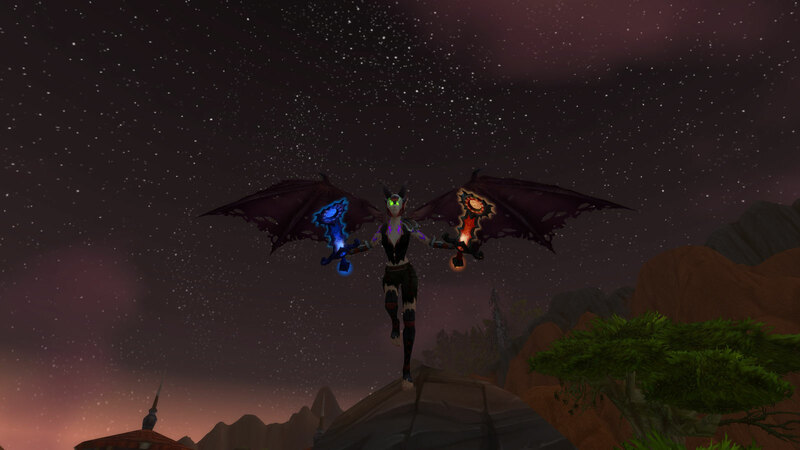 Also, the old demonology meta looked a lot cooler. It is very ironic, I think, that in the expansion that puts its focus on class identity, the new class has so little identity of its own. Of the two specs (I still it’s baloney Blizzard couldn’t be bothered to make three), vengeance is my clear preference right now. I can’t put my finger on what it is, but something about havoc just feels off to me. Vengeance didn’t blow me away out of the gate, but it’s growing on me. I like the aesthetics of the spec — the sound effects especially — and I get the impression it will be an outstanding soloing spec. I’ll stick with my demon hunter for now, but I don’t think it’s new main material or anything.